Please visit us at any of our upcoming shows. We always look forward to the opportunity to better get to know our Customers and Industry partners. Check back regularly for an updated list of shows or events. Ask us for more information if you are interested in stopping by our booths or attending one of our private events. Here’s one of our Founders Chris at MTA this year! Here’s a taste of what you missed at the Rochester Security Summit. Join us at the 110th annual MTA show, March 18-20! 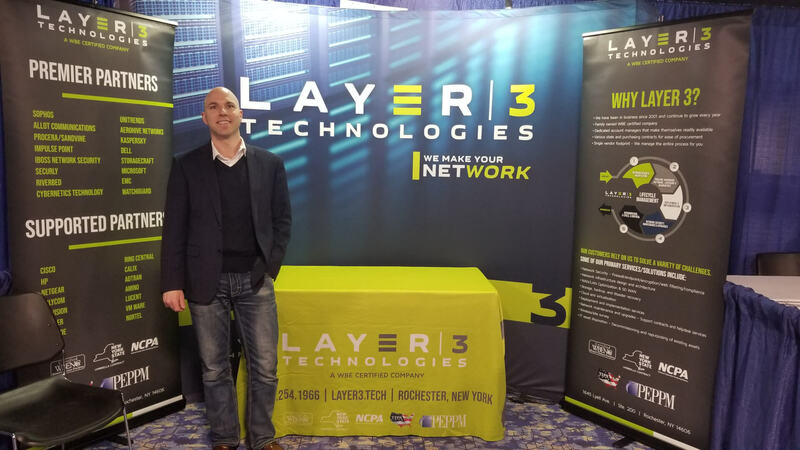 Layer 3 will be making the trip to Minnesota this year to take part in the largest state Telecommunications Convention and Trade show in the nation. Be sure to stop by booth #102 to say hello. Layer 3 Technologies will be hosting Make a night of IT, sponsored by our Partners Sophos & Unitrends. Enjoy a stress free evening of trivia, food, drinks, and giveaways at the Railroad St. Beer Hall while getting to know other local businesses and IT Professionals. Reservations are limited to (2) seats per organization. Please fill out the form above if you are interested in attending. After registering for this event, you will be sent a confirmation email and mailed event tickets. Keep and bring your tickets with you! The Rochester Security Summit is a community focal point for education and awareness in collaboration with higher education, business and industry partners, held during National Cyber Security Awareness Month. The Summit features speakers and panels to help educate area security and IT professionals, business managers, organizations and our community on how to protect information systems and data. Please stop by our table to get to know us a little better. We look forward to meeting you!